followed by the HARRA Members' Appreciation/Family Picnic! TC Jester Park - ​4201 TC Jester Blvd Houston, TX 77018. Saturday, May 11, 2018. 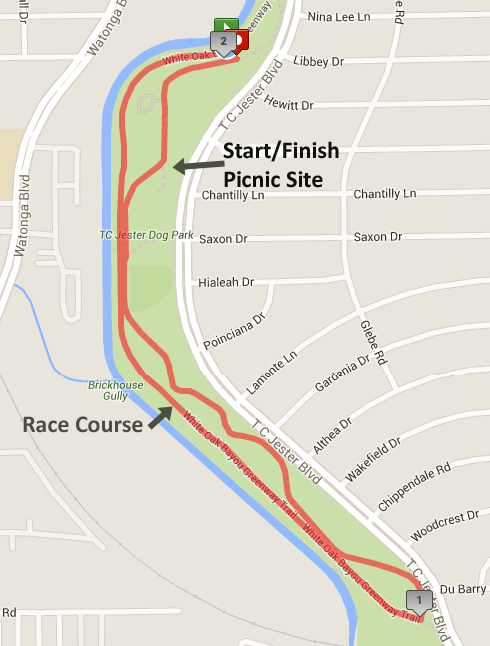 Relay begins at 4:00 PM, and the picnic begins right afterwards. Benefiting BCRR Young Runner's Scholarship Fund. Support our next generation of Texas runners! Click HERE for the Registration Link. You will need all team member's information: (Name, DOB, HARRA number, etc) available for registration. Bayou Bash Relay, c/o Bayou City Road Runners, P.O. Box 66196, Houston, TX 77266. Must be postmarked by May 5. Early bird registration is $80 per team (+ processing fee). Each HARRA member receives a $1 discount. Race day registration is $100 per team, and no HARRA discount. LOCATION: Packet pick up last year was at Fleet Feet in Rice Village and on site at TC Jester Park. Stay tuned! This is a relay race with 4 persons per team and each leg/person completing a single loop course just over 2 miles. Course MAP HERE. After the race, prizes for top 3 finishing teams will be presented in the following categories: Open male/female, Open mixed, Masters (40+) male/female, Mixed Masters, Senior (50+) male/female, Veteran (60+) male/female, Ultra-Vet (70+) male/female, and junior divisions. Individual runners will be chip timed! Participants will be able to see their specific race time as well as their team's overall time. SPONSORS: The Bayou Bash Relay is not a free event. To learn how YOU can help sponsor this event, please contact Mike Mangan at mikemangan41@yahoo.com.